That moment during the Philippines-Australia group play in the FIBA World Cup Asian Qualifiers when tempers flared – and punches, kicks, and even water bottles flew – now have, undoubtedly, turned into a lifelong regret. This after FIBA, on Thursday afternoon, finally handed down sanctions on everyone involved in the ugly brawl last July 2 at the Philippine Arena. Basketball’s world governing body meted out penalties to players and team officials who were involved in the free-for-all that occurred in the third period of the game. 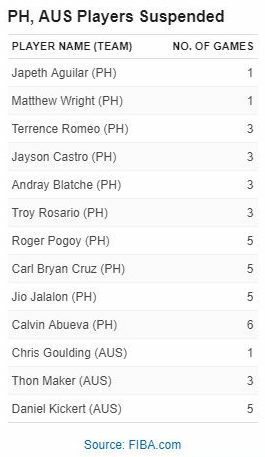 Gilas Pilipinas mainstays who are barred from seeing action are Calvin Abueva, RR Pogoy, Jio Jalalon, naturalized center Andray Blatche, Jayson Castro, Terrence Romeo, Troy Rosario, Japeth Aguilar, and Matthew Wright. Among the 10, Abueva will serve the lengthiest suspension with six games followed by Pogoy, Cruz, and Jalalon who will sit out five outings. Team captain Gabe Norwood, June Mar Fajardo, and Baser Amer, meanwhile, were spared from any punishment. FIBA also penalized assistant coach Jong Uichico, giving him a three-game suspension for unsportsmanlike behavior while head coach Chot Reyes will sit out one game for inciting unsportsmanlike behavior and ordered to pay a fine of 10,000 Swiss Francs or roughly Php534,000. The Samahang Basketbol ng Pilipinas also drew a disciplinary fine of 250,000 Swiss Francs or around Php13.3-million. The Philippines also will be forced to play their next home game behind closed doors — with no crowd — while a ban for two more home games has been placed under a probationary period of three years. Over at the Australian side, Daniel Kickert, whose elbow strike to Pogoy sparked the ugly in-game fight, will serve out a five-game suspension while Thon Maker and Chris Goulding are barred for three games and one game, respectively. FIBA also ordered Basketball Australia to pay a fine of 100,000 Swiss Francs or over Php5-million. 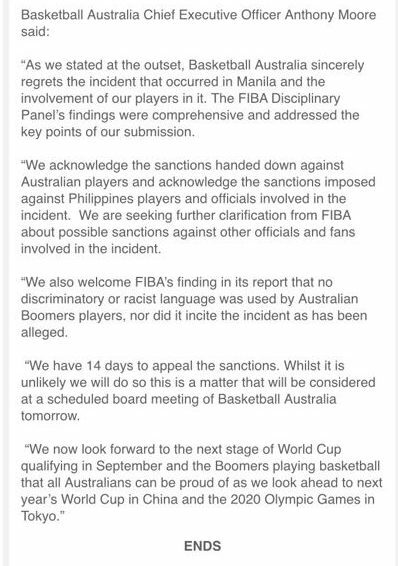 “As we stated in the outset, Basketball Australia sincerely regrets the incident that occurred in Manila and the involvement of our players in it. The FIBA Disciplinary Panel’s findings were comprehensive and addressed the key points of our submission,” said Anthony Moore, Basketball Australia Chief Executive Officer, in a statement posted on Twitter. Apart from the sanctions handed to both teams and national federations, FIBA Secretary General Patrick Baumann also has plucked the game officials — Ahmed Al Bulushi of Oman, Hatim Alharbi of Saudi Arabia and Paul Skayem of Lebanon — from the FIBA Elite Program. The referees will also not be nominated to any international competitions organised or recognised by FIBA (including at Zone and Sub-zone level) for a period of one year. Money from the fines will be used to support the “Basketball for Good” social program launched by the International Basketball Foundation (IBF).